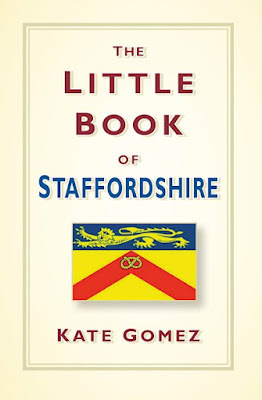 This is one of the many vignettes and stories from history and folklore recorded by Kate Gomez in her delightful new book published last year, The Little Book of Staffordshire (Stroud: The History Press, 2017, £9.99). It is a story first recorded, as far as I know, by the 17th century historian, Robert Plot, Keeper of the Ashmolean Museum, Oxford, who records this superstition about ‘the knocking before the death of any of ... the family of Cumberford of Cumberford in this County; three knocks being always heard at Cumberford-Hall before the decease of any of that family, tho’ the party dyeing be at never so great a distance’ – Robert Plot, The Natural History of Staffordshire (Oxford, 1686), pp 329-330. Robert Plot (1640-1696) was an English naturalist, the first Professor of Chemistry at the University of Oxford, and the first keeper of the Ashmolean Museum. In his Natural History of Staffordshire, Plot also describes a double sunset viewable from Leek, the Abbots Bromley Horn Dance, and, for the first time, the Polish swan, a pale morph of the mute swan. Kate Gomez is today’s Dr Plot, sharing details that are sometimes in danger of being passed over by other historians, and she knows how to bring a child-like joy to adults who have a true sense of place. I bought her book in the Cathedral Shop in Lichfield during my latest visit. It is enriched by her many interests in Lichfield Lore, which gives the name to her blog, and wider Staffordshire lore, from mediaeval graffiti to Sandwells Pumping Station, to old customs like beating the parish bounds, and the lost graves and estates of the Marquesses of Donegall – who also, at one time, owned Comberford Hall. The knock came at the door for George Augustus Chichester, when he risked his inheritance through his gambling addictions. To pay off his debts, her married the illegitimate daughter of a moneylender, and Fisherwick Hall was inherited instead by his brother Lord Spencer Stanley Chichester. Fisherwick Hall was eventually demolished, and when rabbits found their way into the Donegall family coffins in Saint Michael’s Church, Lichfield, and the family mausoleum was demolished too. On a more cheerful note, did you know that Marmite, Pointon’s Sweets, Hovis Bread and Branston Pickle all have their origins in Staffordshire? Here are the 18 lost villages of Staffordshire, 16 hospitals (though not Dr Milley’s or Saint John’s in Lichfield), 15 royal visits, 14 VCs, 12 members of the Lunar Society, 11 wells, 10 wells, eight lost houses, eight inventions by Erasmus Darwin, seven Staffordshire saints, five castles and five Staffordshire entries in the Guinness Book of Records, four MPs, three cathedral spires, two interlocking church stairs (in Saint Editha’s, Tamworth), the first football knight … and if I reread the book again this morning, I would not be surprised to find that partridge in the pear tree too. There are stories of royal visits – though no reference how the future Charles I was once a guest of the Comberford family at the Moat House in Tamworth. There are stories about Izaak Walton, Samuel Johnson, Jane Austen, Philip Larkin, Jonathan Swift, JRR Tolkein, Carol Anne Duffy, AN Wilson – and an unfortunate typographical reference to Irish Murdoch, all the more interesting because Iris Murdoch was Irish-born. And there are stories about ‘Singing Kate’s Hole’, aHenry Paget’s lost leg at Waterloo, Bessy Banks’s Grave, headless horsemen, the world’s first-ever long-distance air race, the first man to swim the English Channel, the highest village in England, and the Sleeping Children in Lichfield Cathedral. The book also rekindles some childhood memories. I am old enough to wave watched Sir Stanley Matthews playing for Stoke City. But I also recalled when I was about 11 or 12 and living in Dublin when some friends introduced me to a schoolboys’ soccer club called Port Vale. I think there was a clubhouse in the Donore Avenue area, but home games were played in Bushy Park in Terenure. I must have been no good, because I only remember playing with Port Vale for a few weeks. But I often wondered why the club was called Port Vale, after a club in the Potteries in North Staffordshire. To compound those thoughts, I wondered how the original Port Vale got its name as Burslem is so far inland and nowhere near a coastal port. It is a conundrum that was as insoluble as my later teenage questions about why there is a statue of Captain Edward Smith of the Titanic in Beacon Park, about as far inland in England as one can get for a sea captain. Kate Gomez blogs at Lichfield Lore, organises the social history group Lichfield Discovered and is Deputy Editor of CityLife in Lichfield and Living in Tamworth. This book is a must for the organisers of any table quiz in Staffordshire. But please, please, be careful about how you come knocking at the door. Captain Smiths statue was to go in Hanley, his birthplace, but after the Titanic sank, they didn't want it. Lichfield took it, as a free statue going begging. Not ones to look a gift horse in the mouth, sinking or no sinking, the statue was offloaded to Lichfield where even today it is surprisingly popular. Hanley wanted it back but Lichfield said no.